Calm manner, external equanimity — all this characterizes Snake-Pisces as a reserved, well-educated person. Always tactful, polite, refers to others with great respect. People consider him to be a model of justice and morality, so it seems to be impeccable. According to the combined horoscope Pisces-Snake — a perceptive, deep personality. It has many advantages: the mind, prudence, compassion. But this man is not as wounded and tender as typical Pisces. The snake endows him with coolness, strength and iron endurance. He is distinguished not only by kindness and patience, but by exactingness, rancor. In general, Snake-Pisces is a temperamental man, thirsty for passions and emotions. This man with gentle, affable manners makes a favorable impression on people. It seems nice and good-natured simpleton, it does not emanate a sense of danger. However, Snake-Pisces is a treacherous person capable of brutal revenge. However, to derive it from itself can only out of the way an extraordinary event. Strong resentment, overt boldness, shameless lies are the causes that can cause the Snake to turn its sting against the enemies. In other cases, she prefers to sleep peacefully and only slightly scrutinizes such vulnerable, inconsistent Pisces. People of this combination do not waste their time and effort in vain. Snake-Pisces begin to take decisive action only in case of emergency. 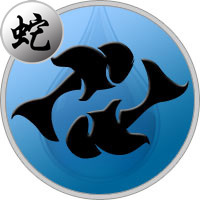 Men and women of Snake-Pisces sign seek a calm, stable life, avoid difficulties in every possible way. After all, it’s much easier to get around the obstacle than persevere over it. Too strong impressions of them quickly tire. Although not averse sometimes plunge into the whirlpool of passions, but for a short time. Pisces-Snake needs love and care, looking for people who share his beliefs. He follows his intuition in everything, rarely makes mistakes in his conclusions. Always knows how best to act in this situation, quickly understands what is his benefit. Possesses mystical abilities, influences life of surrounding people. All his desires are easily fulfilled: fate favors Pisces Snake, usually he is lucky in business. Pisces-Snake can find a common language with almost any person. He does not just understand others, but literally reads their emotions. But he does not hurry to share his thoughts. This is a thoughtful person, inclined to think deeply. He does not take the word for faith, he tries to get to the truth himself. Despite the external coldness, Snake-Pisces is a vulnerable person. Perhaps, therefore, carefully protects his inner world from outside interference. His soul is a mystery to others, he does not always correctly assess his potential. From the people of this combination you can expect just about anything, they are unpredictable and dangerous. The main thing: not to enter into confrontation with them is sure to take revenge. According to the love horoscope of Snake-Pisces — thin, quivering nature, dreaming of an exalted feeling. Modest and restrained, do not like to expose their feelings for show. Even strongly falling in love, do not seek bright emotions and unforgettable impressions. For them, the main thing in a romantic relationship is to find a soul mate. Therefore, they look at their partner for a long time, do not rush with ardent confessions. They like to conduct long conversations with the chosen one or the chosen one in order to finally decide on their choice. This person does not like the soul in close people, he gives all his strength to the family. Snake-Pisces appreciates stability in relations, avoids quarrels and scandals. True, he cares so much about his family that sometimes he bothers them with his advice and instructions. Snake-Pisces is a very demanding person: his children and the second half should be ideal people. Jealous, suspicious, this is a terrible owner and even a tyrant. Although carefully conceals his thoughts and tries to contain negative emotions. Pisces born in the year of the Snake demonstrate excellent business qualities. They are not prone to vain experiences like the rest of the representatives of this water sign. They have a strong intuition, they know how to draw the right conclusions. Pisces-Snakes are pragmatic and prudent, competently dispose of their talents. Quite quickly advance through the ranks, are able to become successful businessmen. Honest, they always keep their word, so they are very attractive as business partners. Nature has given Pisces-Snake a strong intuition, he clearly sees future events. His gift allows you to give the right advice and find the most accurate solutions to problems. The calling of Snake-Pisces is to serve people. Can become a good lawyer, teacher or doctor. Due to his ability to feel deeply and empathize, he is able to embody any image. Often people of this combination choose the profession of an actor. Unlike other Pisces do not hesitate to speak in public. In a man born under the signs of Pisces and Snake, you can find anything: softness, determination, calmness, stubbornness. It combines many opposites, from which he himself suffers much. However, he is a kind, sympathetic person. Has a strong intuition: the feelings of people around him for him are not a secret. Therefore, it is perfectly arranged in a life: has a good post and confidential attitudes with all around. True harsh circumstances can awaken in him the desire to fight and resist. And he will be able to defend his interests. In his personal life he strives to find a serious relationship, looking for a reliable, calm woman. He needs stability, but without restraint of freedom, does not take control and total surveillance. The soft, soulful Pisces-Snake woman, meanwhile, is capable of decisive action in the name of a great goal, strives to be useful to society. It surprisingly combines vulnerability and steel will. She likes to be in the spotlight, does not feel embarrassed at all. However, it is difficult for her to accept criticism, stubbornly defends her convictions. She has a strong intuition, therefore she considers herself right in any situation. Ready to concede to a beloved man, she will try to moderate her ardor for his interests. Snake-Pisces is a quick-tempered woman, but is quite capable of controlling her emotions. In family life, she manifests herself as a devoted partner. Perfectly understands her man, tries to surround him with care.